Abraham Lincoln loses two of his three sons while fighting to save the Union. 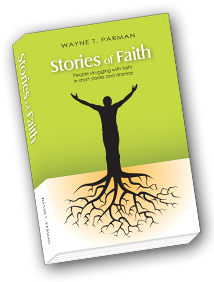 His struggle slowly persuades him to have faith in God. 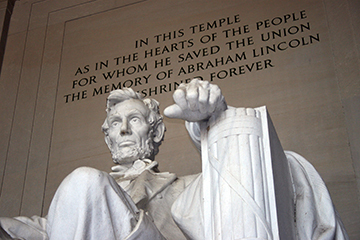 Though not a religious man in his early years, Abraham Lincoln came to place his trust in God as personal losses and the strains of Civil War wore on him. Lincoln and Mary Todd had four sons, lost two of them to illness, one in Springfield, the other while they lived in the White House. These losses drove her to despair, him to consider what he believed about faith in God. His story of faith tells of the enormous pressure of trying to save the Union, debating freeing slaves, and learning to trust God. February 6, 1862. Evening. At a large reception in the White House, AL and Mary shake hands in a receiving line. AL: Good evening, Senator. Our bill was rejected. Sumner: It was good effort, Mr. President. Mary: Charles, bon soir. Bienvenue. AL (smiling): You two and your French. Hay (appearing suddenly, out of breath): Mrs. Lincoln, come quick. Willie has a high fever. He’s calling for you. Mary: Mr. Lincoln, I must go to him. Come when you can get away. AL: As quickly as I can. February 20. President’s office, early morning. Hay enters to find AL sitting at his desk, gaunt from lack of sleep. Hay: Mr. President, you’re here early. My God, the wind and rain are unbelievable this morning. (Noticing AL seems lost in thought) Any news? AL: Willie – my boy is gone – actually gone! Hay: Oh, sir. I’m dreadfully sorry. AL: There was nothing we could do. Twelve years old! Hay: How is Mrs. Lincoln? AL: Inconsolable. Cried for hours. She’s taken to her bed. Hay: It isn’t fair, sir. To lose Willie – after burying Eddie. AL: And Tad still is sick. Hay: Can I get you some coffee? AL: No. Could you leave me for a few minutes? I feel like being alone. Hay: Certainly. I’ll be in the kitchen, if you need me. (He leaves. In a moment, Jacob knocks softly and enters). Jacob: Thought you might like to talk. AL: Only if you have some answers. Jacob: No, I don’t have those. AL: I tried everything. Speeches, dinners, letters, laws, military campaigns. It’s all a failure. I couldn’t even protect my son in my own house. Jacob: Why are you trying it alone? AL: Mary is with me. And the cabinet. The generals support our strategy. Jacob: Do you think your mother and father trusted God, Abraham? Jacob: That’s not what I asked. Did your father trust God? When he moved your family from Kentucky to the wilds of Indiana to live in a lean-to. When he moved you again to that small house in New Salem. When Nancy died. Jacob: You’re stronger than he was. Jacob: When Nancy was dying, how do you think she found strength to think her children would find help? Jacob: Maybe that famous political skill could use an ally. AL: I need help from somewhere. (Putting his face in his hands). Oh, Willie! Jacob: I’ll be leaving now. Think about your father. And your mother. What would they have done? (He leaves).